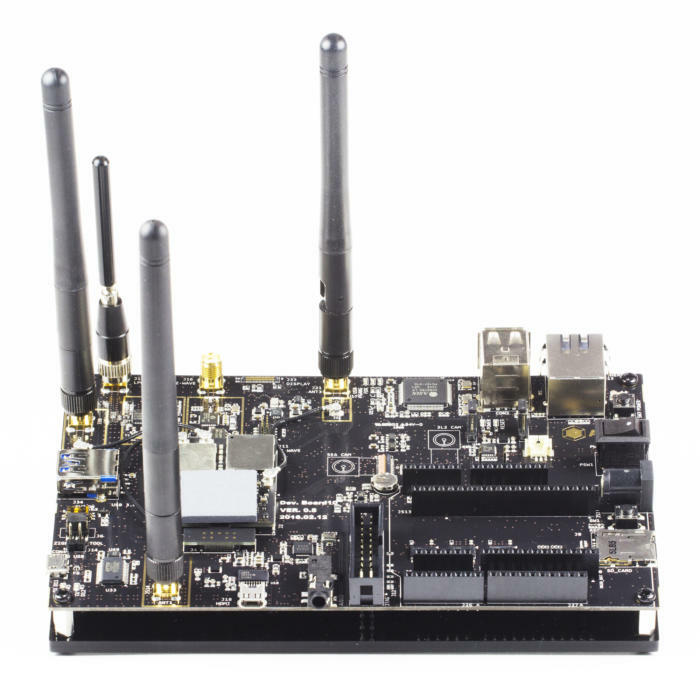 The BeagleBoard.org Foundation is a US-based non-profit corporation existing to provide education in and promotion of the design and use of open-source software and hardware in embedded computing. BeagleBoard.org provides a forum for the owners and developers of open-source software and hardware to exchange ideas, knowledge and experience. The BeagleBoard.org community collaborates on the development of open source physical computing solutions including robotics, personal manufacturing tools like 3D printers and laser cutters, and other types of industrial and machine controls. BeagleBoard.org is the result of an effort by a collection of passionate individuals, including several employees of Texas Instruments, interested in creating powerful, open, and embedded devices. We invite you to participate and become part of BeagleBoard.org, defining its direction. Support for BeagleBoard.org boards comes from the very active development community through this website, the mailing list, and the IRC channel. Original production funding was provided by Digi-Key, a major international distributor, but distribution has now been opened up to dozens of distributors across the world. On-going funding for board prototypes has been provided by manufacturing partners. Texas Instruments generously allows Jason Kridner, community manager and software cat herder, to spend time to provide support and development of the BeagleBoard.org project as part of their duties at TI. Manufacturing partners pay volume prices for the TI (and all other) components. BeagleBoard.org licenses the use of BeagleBoard.org logos for use as part of the Manufacturer, Compliant and Compatible logo programs . BeagleBoard.org also participates as a mentoring organization for Google Summer of Code which pays a small fee for mentoring students. The first five BeagleBoard.org designs (BeagleBoard, BeagleBoard-xM, BeagleBone, BeagleBone Black and BeagleBoard-X15) where all executed by BeagleBoard.org co-founder Gerald Coley of EmProDesign. All the designs are fully open source and components are available for anyone to manufacture compatible hardware. We do request contact and permission before considering the use of the BeagleBoard.org name on any products. The boards are low-cost, fan-less single-board computers based on low-power Texas Instruments processors featuring the ARM Cortex-A series core with all of the expandability of today's desktop machines, but without the bulk, expense, or noise. Initially, development was targeted at enabling Linux distributions to improve support for ARM devices. With tremendous success and support by numerous Linux distributions, development has become more focused on enabling simplified physical computing on advanced GUI-enabled and/or networked-enabled devices with a super-simple out-of-box learning experience and support for development environments familiar to just about every developer, from Ubuntu, QNX, Windows Embedded, Android and web tools to bare metal and even Arduino/Wiring-style programming. For some additional background, you can look at the BeagleBoard brief. 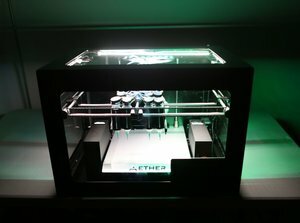 The ideal 3D bioprinter, says tissue engineering expert Y. Shrike Zhang, would resemble a breadmaker: “You’d have a few buttons on top, and you’d press a button to choose heart tissue or liver tissue.” Then Zhang would walk away from the machine while it laid down complex layers of cells and other materials. The technology isn’t quite there yet. But the new BioBot 2 printer seems a step in that direction. The tabletop device includes a suite of new features designed to give users easy control over a powerful device, including automated calibration; six print heads to extrude six different bioinks; placement of materials with 1-micrometer precision on the x, y, and z axes; and a user-friendly software interface that manages the printing process from beginning to end. BioBots cofounder and CEO Danny Cabrera says the BioBot 2’s features are a result of collaboration with researchers who work in tissue engineering. The company’s cloud-based software makes it easy for users to upload their printing parameters, which the system translates into protocols for the machine. After the tissue is printed, the system can use embedded cameras and computer-vision software to run basic analyses. For example, it can count the number of living versus dead cells in a printed tissue, or measure the length of axons in printed neurons. “This platform lets them measure how different printing parameters, like pressure or cellular resolution, affect the biology of the tissue,” Cabrera says. 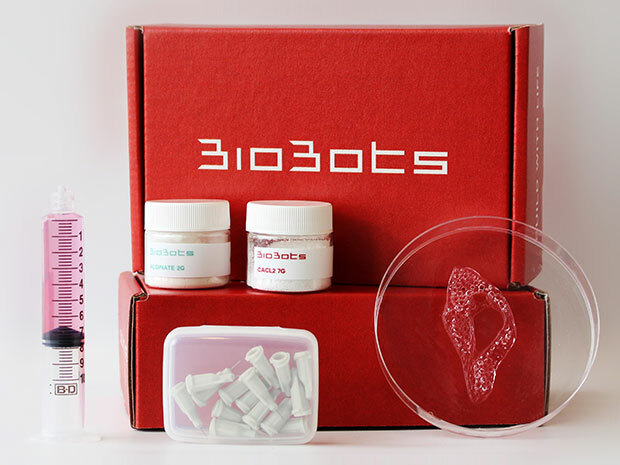 The BioBot 1 hit the market in 2015 and sells for US $10,000. The company is now taking orders for the $40,000 BioBot 2, and plans to ship later this year. 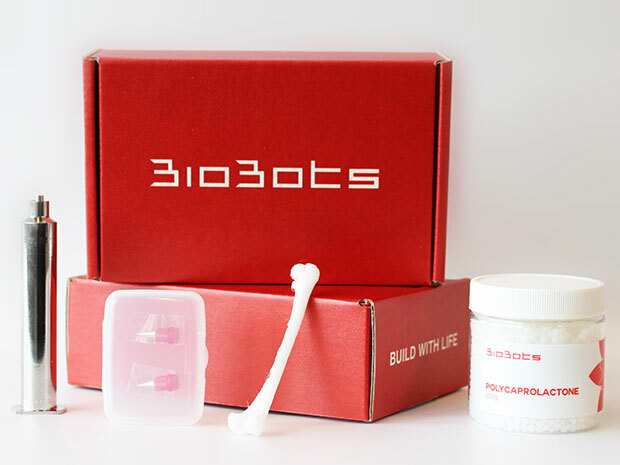 BioBots will soon begin selling a kit with all the materials necessary to print soft tissue, such as cartilage. Each of the BioBot 2’s print heads can cool its bioink to 4 degrees Celsius or heat it to 200 degrees Celsius. The printbed is also temperature-controlled, and it’s equipped with visible and ultraviolet lights that trigger cross-linking in materials to give make printed forms more solid. While some researchers won’t be interested in using the six print heads to make tissue composed of six different materials, Cabrera says the design also allows researchers to multiplex experiments. For example, if researchers are experimenting with the concentration of cells in a bioink, this setup allows them to simultaneously test six different versions. “That can save weeks if you have to wait for your cells to grow after each experiment,” Cabrera says. And the machine can deposit materials not only on a petri dish, but also into a cell-culture plate with many small wells. With a 96-well plate, “you could have 96 lilttle experiments,” says Cabrera. Another kit will include the materials needed to print bone and other hard tissue. One long-term goal of bioprinting is to give doctors the ability to press a button and print out a sheet of skin for a burn patient, or a precisely shaped bone graft for someone who’s had a disfiguring accident. Such things have been achieved in the lab, but they’re far from gaining regulatory approval. An even longer-term goal is to give doctors the power to print out entire replacement organs, thus ending the shortage of organs available for transplant, but that’s still in the realm of sci-fi. While we wait for those applications, however, 3D bioprinters are already finding plenty of uses in biomedical research. Zhang experimented with an early beta version of the BioBot 1 while working in the Harvard Medical School lab of Ali Khademhosseini. He used bioprinters to create organ-on-a-chip structures, which mimic the essential nature of organs like hearts, livers, and blood vessels with layers of the appropriate cell types laid down in careful patterns. These small chips can be used for drug screening and basic medical research. With the BioBot beta, Zhang made a “thrombosis-on-a-chip” where blood clots formed inside miniature blood vessels. Now an instructor of medicine and an associate bioengineer at Brigham and Women’s Hospital in Boston, Zhang says he’s intrigued by the BioBot 2. Its ability to print with multiple materials is enticing, he says, because he wants to reproduce complex tissues composed of different cell types. But he hasn’t decided yet whether he’ll order one. Like so much in science, “it depends on funding,” he says. The BioBot 2 is on the cheaper end of the bioprinter market. The top-notch machines used by researchers who want nanometer-scale precision typically cost around $200,000—like the large 3D-Bioplotter from EnvisionTec. This machine was used in research announced just today, in which Northwestern University scientists 3D-printed a structure that resembled a mouse ovary. When they seeded it with immature egg cells and implanted it into a mouse, the animal gave birth to live pups. But there are a few other bioprinters that compete with the BioBot machines on price. 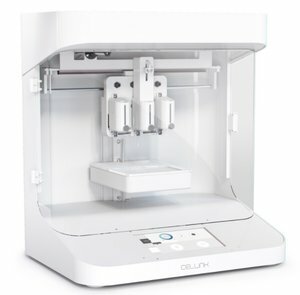 Most notably, a Swedish company called Cellink sells three desktop-sized bioprinters that range in price from $10,000 to $40,000. And a San Francisco startup called Aether just recently began sending beta units to researchers for testing and feedback; the company has promised to begin selling its Aether 1 this year for only $9000. The biggest source of competition may not be other companies, but bioengineers’ innate propensity for tinkering. “We’ll often get some basic sort of printer and make our own print heads and bioinks,” Zhang says. But for biology researchers who don’t have an engineering background, Zhang says, the BioBot 2 would provide a powerful boost in abilities. It would be almost like giving a kitchen-phobic individual the sudden capacity to bake a perfect loaf of whole wheat bread. Photo: University of Michigan and TSMC One of several varieties of University of Michigan micromotes. This one incorporates 1 megabyte of flash memory. Computer scientist David Blaauw pulls a small plastic box from his bag. He carefully uses his fingernail to pick up the tiny black speck inside and place it on the hotel café table. 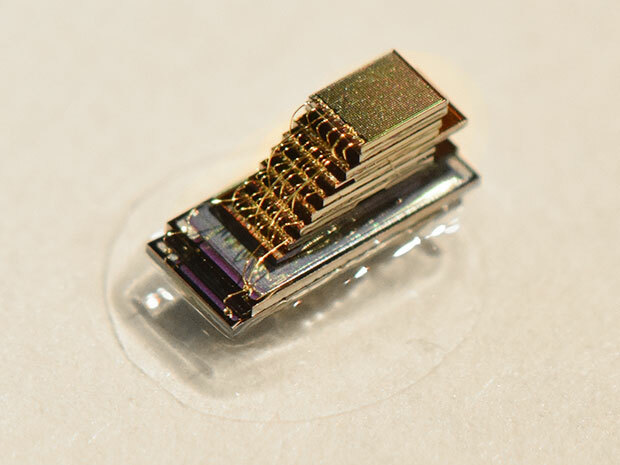 At 1 cubic millimeter, this is one of a line of the world’s smallest computers. I had to be careful not to cough or sneeze lest it blow away and be swept into the trash. Blaauw and his colleague Dennis Sylvester, both IEEE Fellows and computer scientists at the University of Michigan, were in San Francisco this week to present 10 papers related to these “micromote” computers at the IEEE International Solid-State Circuits Conference (ISSCC). They’ve been presenting different variations on the tiny devices for a few years. Their broader goal is to make smarter, smaller sensors for medical devices and the Internet of Things—sensors that can do more with less energy. Many of the microphones, cameras, and other sensors that make up the eyes and ears of smart devices are always on alert, and frequently beam personal data into the cloud because they can’t analyze it themselves. Some have predicted that by 2035, there will be 1 trillion such devices. “If you’ve got a trillion devices producing readings constantly, we’re going to drown in data,” says Blaauw. By developing tiny, energy-efficient computing sensors that can do analysis on board, Blaauw and Sylvester hope to make these devices more secure, while also saving energy. At the conference, they described micromote designs that use only a few nanowatts of power to perform tasks such as distinguishing the sound of a passing car and measuring temperature and light levels. They showed off a compact radio that can send data from the small computers to receivers 20 meters away—a considerable boost compared to the 50-centimeter range they reported last year at ISSCC. They also described their work with TSMC (Taiwan Semiconductor Manufacturing Company) on embedding flash memory into the devices, and a project to bring on board dedicated, low-power hardware for running artificial intelligence algorithms called deep neural networks. The memory research is a good example of how the right trade-offs can improve performance, says Sylvester. Previous versions of the micromotes used 8 kilobytes of SRAM (static RAM), which makes for a pretty low-performance computer. To record video and sound, the tiny computers need more memory. So the group worked with TSMC to bring flash memory on board. Now they can make tiny computers with 1 megabyte of storage. Flash can store more data in a smaller footprint than SRAM, but it takes a big burst of power to write to the memory. With TSMC, the group designed a new memory array that uses a more efficient charge pump for the writing process. The memory arrays are a bit less dense than TSMC’s commercial products, for example, but still much better than SRAM. “We were able to get huge gains with small trade-offs,” says Sylvester. Another micromote they presented at the ISSCC incorporates a deep-learning processor that can operate a neural network while using just 288 microwatts. Neural networks are artificial intelligence algorithms that perform well at tasks such as face and voice recognition. They typically demand both large memory banks and intense processing power, and so they’re usually run on banks of servers often powered by advanced GPUs. Some researchers have been trying to lessen the size and power demands of deep-learning AI with dedicated hardware that’s specially designed to run these algorithms. But even those processors still use over 50 milliwatts of power—far too much for a micromote. The Michigan group brought down the power requirements by redesigning the chip architecture, for example by situating four processing elements within the memory (in this case, SRAM) to minimize data movement. The idea is to bring neural networks to the Internet of Things. “A lot of motion detection cameras take pictures of branches moving in the wind—that’s not very helpful,” says Blaauw. Security cameras and other connected devices are not smart enough to tell the difference between a burglar and a tree, so they waste energy sending uninteresting footage to the cloud for analysis. Onboard deep-learning processors could make better decisions, but only if they don’t use too much power. The Michigan group imagine that deep-learning processors could be integrated into many other Internet-connected things besides security systems. For example, an HVAC system could decide to turn the air-conditioning down if it sees multiple people putting on their coats. After demonstrating many variations on these micromotes in an academic setting, the Michigan group hopes they will be ready for market in a few years. Blaauw and Sylvester say their startup company, CubeWorks, is currently prototyping devices and researching markets. The company was quietly incorporated in late 2013. Last October, Intel Capital announced they had invested an undisclosed amount in the tiny computer company. We invariably imagine electronic devices to be made from silicon chips, with which computers store and process information as binary digits (zeros and ones) represented by tiny electrical charges. But it need not be this way: among the alternatives to silicon are organic mediums such as DNA. DNA computing was first demonstrated in 1994 by Leonard Adleman who encoded and solved the travelling salesman problem, a maths problem to find the most efficient route for a salesman to take between hypothetical cities, entirely in DNA. Deoxyribonucleaic acid, DNA, can store vast amounts of information encoded as sequences of the molecules, known as nucleotides, cytosine (C), guanine (G), adenine (A), or thymine (T). The complexity and enormous variance of different species’ genetic codes demonstrates how much information can be stored within DNA encoded using CGAT, and this capacity can be put to use in computing. DNA molecules can be used to process information, using a bonding process between DNA pairs known as hybridisation. This takes single strands of DNA as input and produces subsequent strands of DNA through transformation as output. Since Adleman’s experiment, many DNA-based “circuits” have been proposed that implement computational methods such as Boolean logic, arithmetical formulas, and neural network computation. 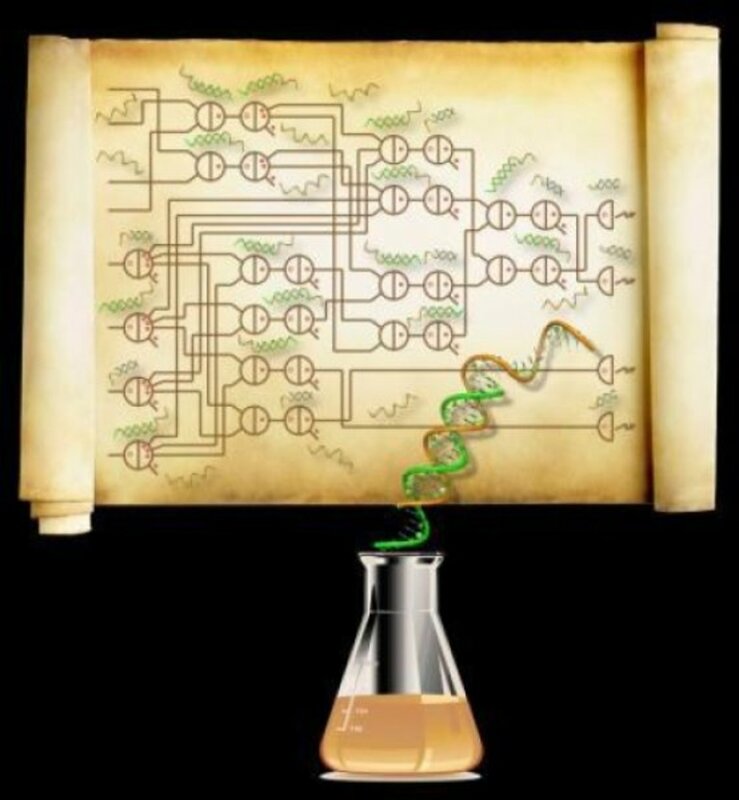 Called molecular programming, this approach applies concepts and designs customary to computing to nano-scale approaches appropriate for working with DNA. In this sense “programming” is really biochemistry. The “programs” created are in fact methods of selecting molecules that interact in a way that achieves a specific result through the process of DNA self-assembly, where disordered collections of molecules will spontaneously interact to form the desired arrangement of strands of DNA. DNA can also be used to control motion, allowing for DNA-based nano-mechanical devices. This was first achieved by Bernard Yurke and colleagues in 2000, who created from DNA strands a pair of tweezers that opened and pinched. Later experiments such as by Shelley Wickham and colleagues in 2011 and at Andrew Turberfield’s lab at Oxford demonstrated nano-molecular walking machines made entirely from DNA that could traverse set routes. One possible application is that such a nano-robot DNA walker could progress along tracks making decisions and signal when reaching the end of the track, indicating computation has finished. Just as electronic circuits are printed onto circuit boards, DNA molecules could be used to print similar tracks arranged into logical decision trees on a DNA tile, with enzymes used to control the decision branching along the tree, causing the walker to take one track or another. DNA walkers can also carry molecular cargo, and so could be used to deliver drugs inside the body. DNA molecules’ many appealing features include their size (2nm width), programmability and high storage capacity – much greater than their silicon counterparts. DNA is also versatile, cheap and easy to synthesise, and computing with DNA requires much less energy than electric powered silicon processors. Its drawback is speed: it currently takes several hours to compute the square root of a four digit number, something that a traditional computer could compute in a hundredth of a second. Another drawback is that DNA circuits are single-use, and need to be recreated to run the same computation again. 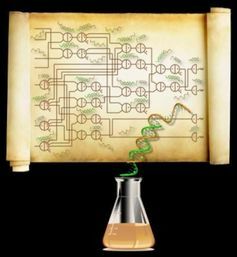 Perhaps the greatest advantage of DNA over electronic circuits is that it can interact with its biochemical environment. Computing with molecules involves recognising the presence or absence of certain molecules, and so a natural application of DNA computing is to bring such programmability into the realm of environmental biosensing, or delivering medicines and therapies inside living organisms. DNA programs have already been put to medical uses, such as diagnosing tuberculosis. Another proposed use is a nano-biological “program” by Ehud Shapiro of the Weizmann Institute of Science in Israel, termed the “doctor in the cell” that targets cancer molecules. Other DNA programs for medical applications target lymphocytes (a type of white blood cell), which are defined by the presence or absence of certain cell markers and so can be naturally detected with true/false Boolean logic. However, more effort is required before we can inject smart drugs directly into living organisms. Taken broadly, DNA computation has enormous future potential. Its huge storage capacity, low energy cost, ease of manufacturing that exploits the power of self-assembly and its easy affinity with the natural world are an entry to nanoscale computing, possibly through designs that incorporate both molecular and electronic components. Since its inception, the technology has progressed at great speed, delivering point-of-care diagnostics and proof-of-concept smart drugs – those that can make diagnostic decisions about the type of therapy to deliver. There are many challenges, of course, that need to be addressed so that the technology can move forward from the proof-of-concept to real smart drugs: the reliability of the DNA walkers, the robustness of DNA self-assembly, and improving drug delivery. But a century of traditional computer science research is well placed to contribute to developing DNA computing through new programming languages, abstractions, and formal verification techniques – techniques that have already revolutionised silicon circuit design, and can help launch organic computing down the same path. While companies like Facebook have been relatively open about their data center networking infrastructure, Google has generally kept pretty quiet about how it connects the thousands of servers inside its data centers to each other (with a few exceptions). Today, however, the company revealed a bit more about the technology that lets its servers talk to each other. It’s no secret that Google often builds its own custom hardware for its data centers, but what’s probably less known is that Google uses custom networking protocols that have been tweaked for use in its data centers instead of relying on standard Internet protocols to power its networks. Google says its current ‘Jupiter’ networking setup — which represents the fifth generation of the company’s efforts in this area — offers 100x the capacity of its first in-house data center network. The current generation delivers 1 Petabit per second of bisection bandwidth (that is, the bandwidth between two parts of the network). That’s enough to allow 100,000 servers to talk to each other at 10GB/s each. We arrange our network around a Clos topology, a network configuration where a collection of smaller (cheaper) switches are arranged to provide the properties of a much larger logical switch. We use a centralized software control stack to manage thousands of switches within the data center, making them effectively act as one large fabric. We build our own software and hardware using silicon from vendors, relying less on standard Internet protocols and more on custom protocols tailored to the data center. Sadly, there isn’t all that much detail here — especially compared to some of the information Facebook has shared in the past. Hopefully Google will release a bit more in the months to come. It would be especially interesting to see how its own networking protocols work and hopefully the company will publish a paper or two about this at some point. 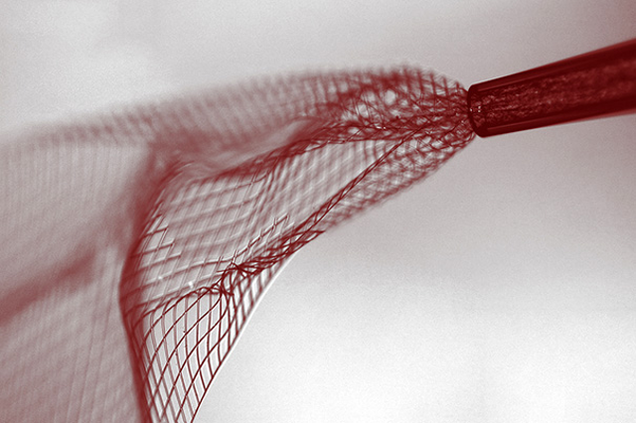 Harvard scientists have developed an electrical scaffold that can be injected directly into the brain with a syringe. By using the technique to “cyborg”-ize the brains of mice, the team was able to investigate and manipulate the animals’ individual neurons—a technological feat the researchers say holds tremendous medical promise. As reported in Nature News, the soft, conductive polymer mesh can be injected into a mouse’s brain, where it unfurls and takes root. And because the mesh can be laced with tiny electronic devices, the implant can be custom-designed to perform a number of tasks, from monitoring brain activity to stimulating brain functions. Once proven safe, the technology could be applied in humans, where it could be used to treat Parkinson’s, among other cognitive disorders. The details of this research, led by Harvard’s Charles Lieber, can be found in the journal Nature Nanotechnology. "The Harvard team [used] a mesh of conductive polymer threads with either nanoscale electrodes or transistors attached at their intersections. Each strand is as soft as silk and as flexible as brain tissue itself. Free space makes up 95% of the mesh, allowing cells to arrange themselves around it. In 2012, the team showed that living cells grown in a dish can be coaxed to grow around these flexible scaffolds and meld with them, but this ‘cyborg’ tissue was created outside a living body. “The problem is, how do you get that into an existing brain?” says Lieber. The team’s answer was to tightly roll up a 2D mesh a few centimetres wide and then use a needle just 100 micrometres in diameter to inject it directly into a target region through a hole in the top of the skull. The mesh unrolls to fill any small cavities and mingles with the tissue. Nanowires that poke out can be connected to a computer to take recordings and stimulate cells." Using this technique, the researchers implanted meshes consisting of 16 electric elements into two different brain regions, enabling them to monitor and stimulate individual neurons. The researchers would like to scale up to hundreds of devices outfitted with different kinds of sensors. In the future, these arrays might be used to treat motor disorders, paralysis, and repair brain damage caused by stroke. What’s more, these implants could conceivably be used in other parts of the body. But before they get too carried away, the researchers will have to prove that the implantable technology is safe in the longterm. Read more at Nature News. And check out the scientific study at Nature: “Syringe-injectable Electronics”. Technology giant IBM announced two major breakthroughs towards the building of a practical quantum computer, the next evolution in computing that will be required as Moore’s Law runs out of steam. Described in the April 29 issue of the journal Nature Communications, the breakthroughs include the ability to detect and measure both kinds of quantum errors simultaneously and a new kind of circuit design, which the company claims is "the only physical architecture that could successfully scale to larger dimensions." The two innovations are interrelated: The quantum bit circuit, based on a square lattice of four superconducting "qubits" -- short for quantum bits -- on a chip roughly one-quarter-inch square, enables both types of quantum errors to be detected at the same time. The IBM project, which was funded in part by the Intelligence Advanced Research Projects Activity (IARPA) Multi-Qubit Coherent Operations program, opts for a square-shaped design as opposed to a linear array, which IBM said prevents the detection of both kinds of quantum errors simultaneously. 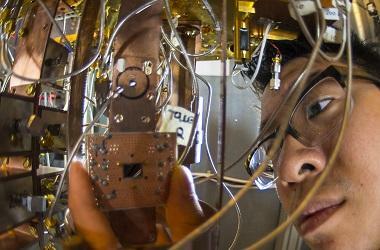 Jerry M. Chow, manager of the Experimental Quantum Computing group at IBM’s T.J. Watson Research Center, and the primary investigator on the IARPA-sponsored Multi-Qubit Coherent Operations project, told InformationWeek that one area they are excited about is the potential for quantum computers to simulate systems in nature. "In physics and chemistry, quantum computing will allow us to design new materials and drug compounds without the expensive trial-and-error experiments in the lab, dramatically speeding up the rate and pace of innovation," Chow said. "For instance, the effectiveness of drugs is governed by the precise nature of the chemical bonds in the molecules constituting the drug." He noted the computational chemistry required for many of these problems is out of the reach of classical computers, and this is one example of where quantum computers may be capable of solving such problems leading to better drug design. The qubits, IBM said, could be designed and manufactured using standard silicon fabrication techniques, once a handful of superconducting qubits can be manufactured quickly and reliably, and boast low error-rates. "Quantum information is very fragile, requiring the quantum elements to be cooled to near absolute zero temperature and shielded from its environment to minimize errors," Chow explained. "A quantum bit, the component that carries information in a quantum system, can be susceptible to two types of errors -- bit-flip and phase-flip. It either error occurs, the information is destroyed and it cannot carry out the operation." He said it is important to detect and measure both types of errors in order to know what errors are present and how to address them, noting no one has been able to do this before in a scalable architecture. "We are at the stage of figuring out the building blocks of quantum computers -- a new paradigm of computing completely different than how computers are built today," Wong said. "In the arc of quantum computing progress, we are at the moment of time similar to when scientists were building the first transistor. If built, quantum computers have the potential to unlock new applications for scientific discovery and data analysis and will be more powerful than any supercomputer today." The Internet of Things invasion: Has it gone too far? Remember when the Internet was just that thing you accessed on your computer? Today, connectivity is popping up in some surprising places: kitchen appliances, bathroom scales, door locks, clothes, water bottles… even toothbrushes. That’s right, toothbrushes. The Oral-B SmartSeries is billed as the world’s first “interactive electric toothbrush” with built-in Bluetooth. Whatever your feelings on this level of connectivity, it’s undeniable that it’s a new frontier for data. And let’s face it, we’re figuring it out as we go. Consequently, it’s a good idea to keep your devices secure - and that means leveraging a product like Norton Security, which protects mobile devices and can help keep intruders out of your home network. Because, let’s face it, the last thing you want is a toothbrush that turns on you. Welcome to the age of the Internet of Things (IoT for short), the idea that everyday objects - and everyday users - can benefit from integrated network connectivity, whether it’s a washing machine that notifies you when it’s done or a collar-powered tracker that helps you locate your runaway pet. Some of these innovations are downright brilliant. Others veer into impractical or even unbelievable. And some can present risks that we’ve never had to consider before. Consider the smart lock. A variety of companies offer deadbolt-style door locks you can control from your smartphone. One of them, the August Smart Lock, will automatically sense when you approach your door and unlock it for you, even going so far as to lock it again once you’ve passed through. And the August app not only logs who has entered and exited, but also lets you provide a temporary virtual key to friends, family members, a maid service, and the like. That’s pretty cool, but what happens in the event of a dead battery - either in the user’s smartphone or the lock itself? If your phone gets lost or stolen, is there a risk a thief can now enter your home? Could a hacker “pick” your digital lock? Smart lock-makers promise safeguards against all these contingencies, but it begs the question whether the conveniences outweigh the risks. Do we really need the Internet in all our things? The latest that-can’t-possibly-be-a-real-product example made its debut at this year’s Consumer Electronics Show: The Belty, an automated belt/buckle combo that automatically loosens when you sit and tightens when you stand. A smartphone app lets you control the degree of each. Yep. Then there’s the water bottle that reminds you to drink more water. The smart exercise shirt your trainer can use to keep tabs on your activity (or lack thereof). And who can forget the HAPIfork, the “smart” utensil that aims to steer you toward healthier eating by reminding you to eat more slowly? Stop the Internet (of Things), I want to get off. Okay, I shouldn’t judge. And it’s not all bad. There is real value in - and good reason to be excited about - a smart basketball that helps you perfect your jump shot. Or a system of smart light bulbs designed to deter break-ins. Ultimately, the free market will decide which ones are useful and which ones are ludicrous. 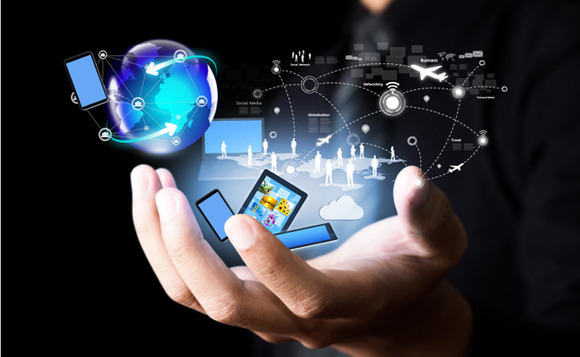 The important thing to remember is that with the IoT, we’re venturing into new territory. We’re linking more devices than ever to our home networks. We’re installing phone and tablet apps that have a direct line not just to our data, but also our very domiciles.